The Timothy M. Smith Inspiration Through Exploration Award will be presented annually to an Honors Program student. The award provides a talented student author with an opportunity to travel and find inspiration. The selected student will receive $2,500 for summer travel expenses. The annual award, offered through the Honors Program, has been established to honor the life of Timothy M. Smith. Although a lawyer by trade, Tim's true passion was traveling the world and writing about his many experiences. The award is funded by the family of Timothy M. Smith. Any University of Tampa undergraduate Honors Program student in good standing is eligible. 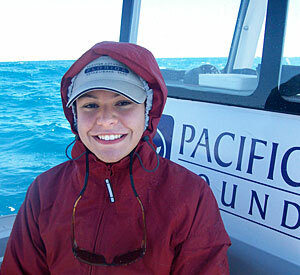 UT student Lorain Knapp used her Smith scholarship for the Humpback Whale research internship in Hervey Bay, Australia. Knapp assisted in a multi-million dollar research project focused on marine mammal behavior. An original nonfiction essay. This essay should be no more than 3,000 words. A short essay, limited to 500 words, on why the candidate believes they will benefit from the award. A summary, limited to 500 words, of how and where the candidate would travel if selected. The above information should be submitted via the online submission portal. Travel must be completed prior to completing coursework required for graduation. Each year's recipients must submit an essay detailing their experiences during their summer journey. Essays will be posted at www.inspirationthroughexploration.com. For more information on the Timothy M. Smith Inspiration Through Exploration Award, visit www.inspirationthroughexploration.com or contact the Honors Program.